When shuffling our room around to accommodate our new sectional, I had to switch to a smaller scaled end table. 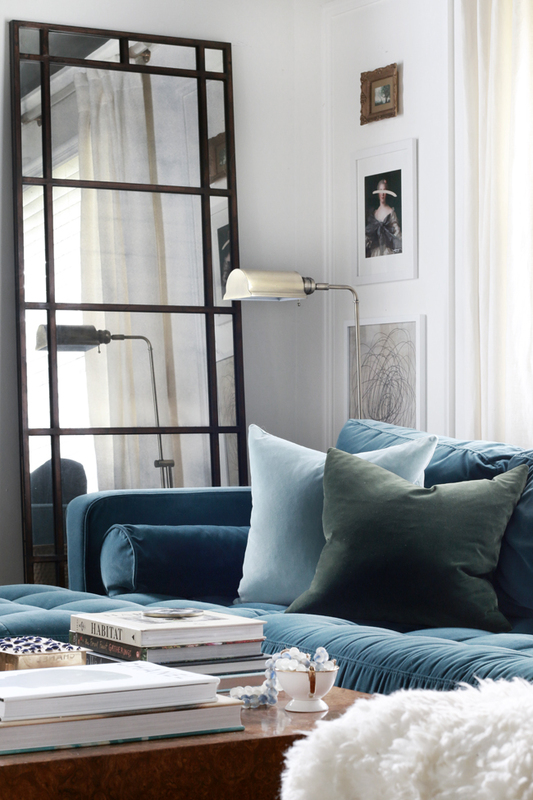 This led to the decision to opt for a floor lamp behind the table vs. a table lamp. There would just not be enough space to accommodate a lamp and well, anything else on the table! 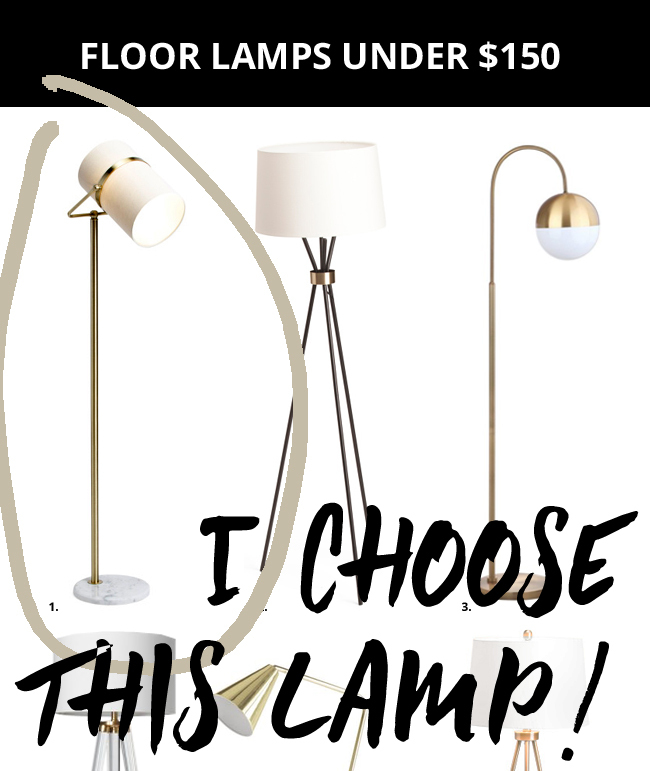 I went through dozens of options trying to find the perfect lamp for the space (as well as budget). I had shared a small round up of options all under $150! Beautiful lamps, at even better prices. And I ordered one of those, or two I should say. They arrived, I opened the first box, and assembled the lamp. Perfect. Loved it! The second lamp however arrived with a shattered marble base. I was bummed, but it happens. After doing countless installs, my experience is that if something is going to arrive broken it is most likely going to be a lamp, mirror or artwork. So I simply reordered the same lamp. Surely it would arrive in perfect shape. Negatory. After another week, the third lamp arrived with yet another shattered base. At this point, I wasn’t about to reorder again. Obviously this was a reoccurring issue and I would only be wasting my time trying to get my hands on another one that was in tact. So I scrapped the idea of that particular lamp and went forward with another plan. I share this not to slam a particular product, but only to display that when pulling a room together things happen. Something arrives broken, or the color isn’t quite right, or the scale… don’t let this paralyze your decisions moving forward. I am actually pleased that I had to reselect the lamps because I am so much happier with the new choice. I opted for a pharmacy style reading lamp. 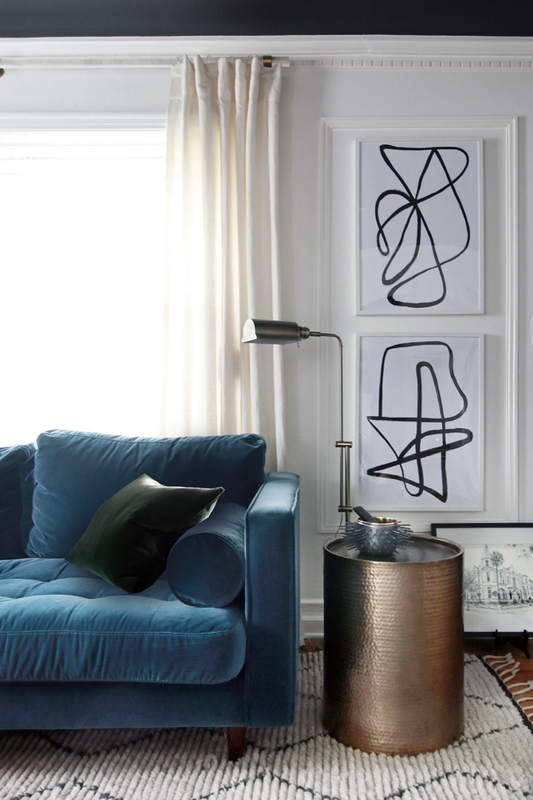 This style of lamp is a classic and timeless lamp that provides direct task lighting where directed. We did not necessarily need lamps to light the room, we needed task lights in the evening for reading. Using two of these on either side of the sectional was a bit of an unexpected choice, but they suit our family’s needs perfectly. I also have to share the info on these hammered metal tables and the artwork. First the tables! These guys are sturdy, well scaled drum tables that have a great weight. They are heavy enough to stay in place, despite being hollow. The finish is aged a bit, just enough to not worry about scratching or dinging a pristine finish. And the best part, they were only around $60! I found them at Target and while they are currently sold out, they have been restocked a few times since I placed my order. So keep an eye out if you are interested. They also come in a silver finish too. Now for the art. Another steal. These were downloadable prints I found on Etsy. You simply buy the file and you receive a JPEG to print on your own. I sent mine to our local Copy shop and requested the size I needed to fill my frames. All in, including printing, each print was around $20. A great option when looking for affordable art. Here are the links for the top print and the bottom one. Jenny’s Print Shop has some beautiful pieces too! Be sure to check out her shop if you are on the hunt for some downloadable artwork.